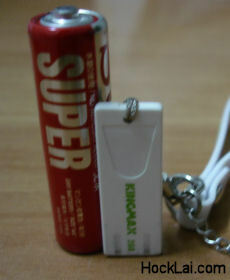 The Kingmax Super Stick could easily be awarded for being the world’s smallest USB drive in the market today. It’s easily half the size of any competitor’s smallest USB drive available today. The design of the Kingmax Super Stick has redefined the definition of a small USB drive. It has borrowed the contact pin interface of the many memory cards (such as Memory Stick/SD/MMC/xD Card) into the world of USB drive. 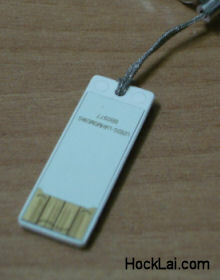 Thus, there isn’t a male USB Type-A port on this USB drive, which gives the Kingmax Super Stick the small size advantage. It’s also good to know that the Kingmax Super Stick is cap-less. While many of the newer USB drives have began to include some sort of a cap attached to the actual USB drive, the Kingmax Super Stick is just a piece of stick with its flat contact points exposed. Can the exposed contact points survive the scratches from normal usage and rough handling over the years that may prevent it from functioning properly? Only time will tell. The Kingmax Super Stick also boasts its water-proof properties. Its electronic components are sealed well within the stick and could easily survive a dip into a glass of water without worries of damaging the USB drive. However, the compactness of the Kingmax SuperStick has left out a LED activity indicator which can be very useful to know if the USB drive is in use. On the performance side, the Kingmax Super Stick isn’t as blazing fast as some of the USB drives in the market, but more of a mediocre performer. A test on SiSoftware Sandra XI 2MB files test benchmark gives a pretty good read speed of 15770 kB/sec but a rather slow write speed of 1843 kB/sec. The 2GB of storage space should be sufficient for most of today’s user needs to store their documents, songs, and commonly used applications on the go (Check out PortableApps.com). 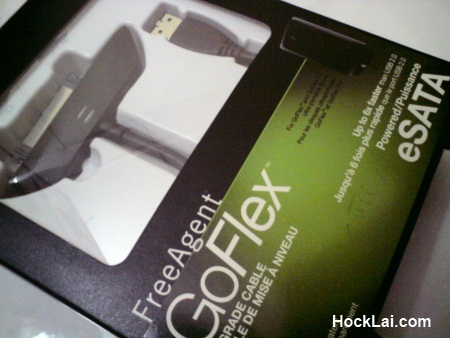 Overall, its a good USB drive that is small in size with a 2GB capacity to meet most of our portable storage needs. 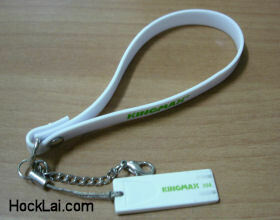 The provided lanyard is strongly recommended to be attached onto the small Kingmax Super Stick or it could be easily lost. The data transfer performance should have been better to better reflect its identity as a Super Stick. The Kingmax Super Stick may cost a little more than the many other USB drives in the market, but the size and design might just justify it (for me at least). Actually, the drive failed on me within 1 month. It is actually physically designed poorly and it cracks at the usb junction point. In addition, the transfer speeds on this drive is incredibly slow. I love how small it is physically but you will NEVER be able to use the full drive size simply due to the very slow write / read speeds. I wrote a review about this drive and essentially, great drive if they had kept it to original specs. but they actually ended up putting a cheaper drive controller in the system which is why it is so slow. I would spend a litle more on a larger , faster, more durable drive like the kingston migo or something. new kingmax super stick already come with 4.27mb/s write speed. i also having the 4gb version of it. Hock Lai Blog ;) Copyright © 2019.